"There are some 500 billion plastic bags every year in the world," photographer Alain Delorme exclaimed to The Huffington Post. "Made in a few seconds, used in a few dozen minutes and [they take] a few hundreds years to disappear from our Earth." If you live in an urban environment you're no doubt familiar with the sensation of encountering a lone plastic bag zipping through the breeze without origin or explanation. Though of course the image is upsetting, in terms of the waste and pollution contained within, there's something viscerally compelling about it as well. "There is something poetic to it –- as beautifully featured in the iconic sequence of the movie "American Beauty" -– a plastic bag flying like a dancer. Just like a swarm of birds finding their way to their nest at sunset. But the plastic bag is more often frightening –- the very symbol of our consumer society is also the one of pollution, now a continent of its own... but invisible, hidden deep in the ocean." 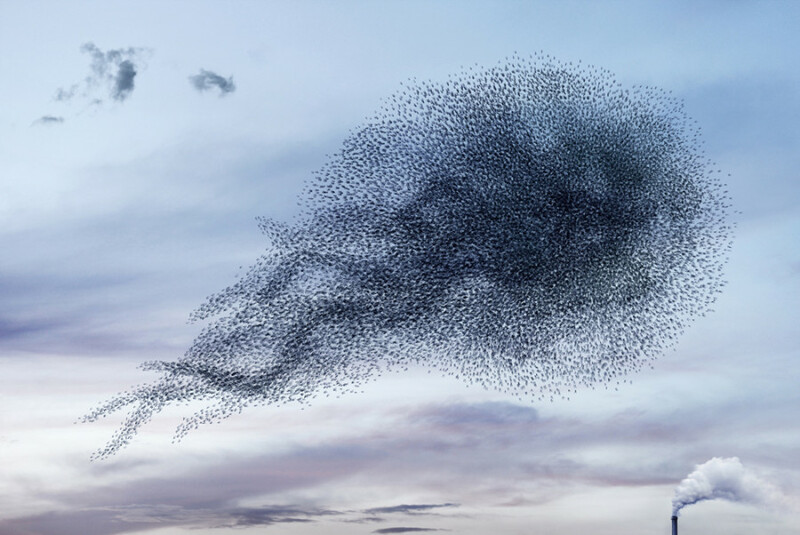 In his striking series "Murmurations -- Ephemeral Plastic Sculptures," Delorme poses a visual question that's impossible to look away from. "What if [that continent] all of a sudden boldly appeared in the sky? Borrowing the beauty of the swarm of birds gracefully flying at sunset, but also their frightening aspect –- as in "The Birds" movie by Hitchcock. It remains stunningly beautiful but also perversely invasive, clearly highlighting the plastification of the world." While many environmentally driven artworks set out to communicate a specific perspective or unseen reality, Delorme prefers to leave his images shrouded in mystery. His digitally manipulated plastic hives swoop and whirl through the open sky for all to see, their translucent bodies resembling jellyfish against the sunset. The resulting photographic works evoke the effects of land art, merging the artificial and natural worlds in a virtual space. "I am here to question –- people then make their own interpretation. Some people will think about consumer society due to the accumulation effect and the signs of human presence, others to land art or to environment questions due to the natural context…" In this respect, Delorme bears a likeness to artists like Barry Underwood and Chris Jordan, who present pressing environmental issues in surprising ways. If nothing else, Delorme's plasticized visions will make you pause for a moment to appreciate the uncertainty a single image can hold. "Today things go so fast, people often do not take the time for in-depth analysis and miss lots of information. 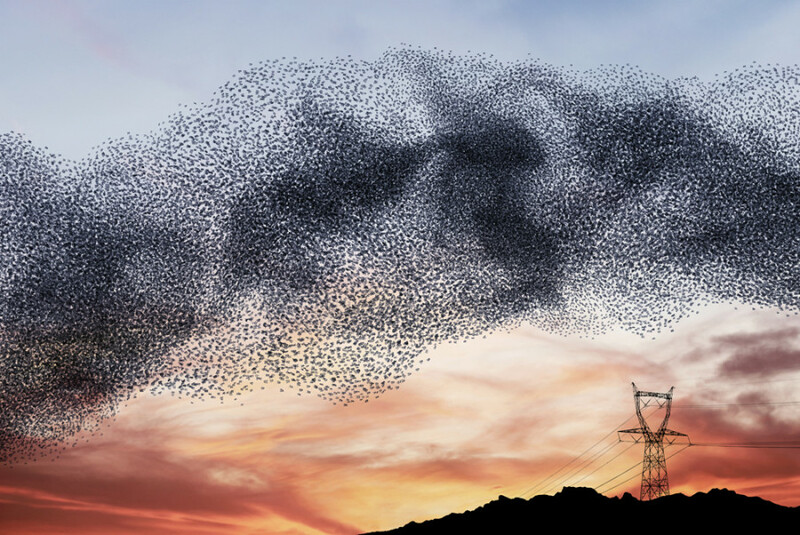 I like the idea that curiosity here pays off: if you’re curious enough to get closer, you realize that the swarm of birds is actually made of plastic bags and you get the idea." "Murmurations" offers a portrait of contemporary culture at once dark and mystifying, mythical and very real. The toxic swarms bring to the surface what's long been boiling underneath; the image is both horrifying and oddly transfixing. Take a look below.